Australia is heavily dependent upon coal exports for its balance of payments. This is obviously completely unconnected to Australian Federal governments, from Keating (1991-1996) onwards, doing everything they can to scupper international climate negotiations, or, failing that, carve out the sweetest possible deal for itself. In 1997, simply by threatening to veto, and some fancy 1am footwork, the Australians extracted an increase for themselves when everyone else bar the Norwegians and Iceland promised cuts. After all that palaver, Prime Minister John Howard announced, on World Environment Day 2002, that Australia would not ratify. The whole Kyoto process dragged along until the Russians decided they could sign and make some money, which they did in late 2004. 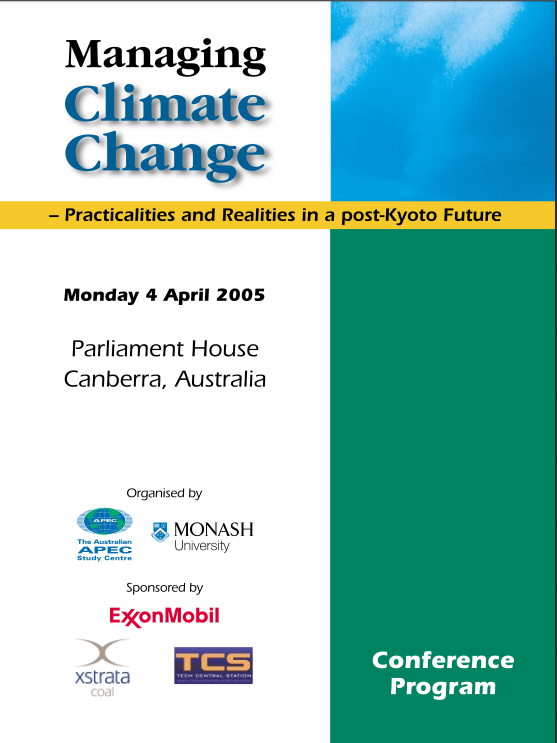 Kyoto came into “force”, therefore, just before the 2005 APEC conference at Parliament House in Canberra, “Managing Climate Change: Practicalities and Realities in a post-Kyoto future”. It was one of a series of events that gave aid and comfort and networking opportunities to those who believe climate change isn’t happening/isn’t important/is a communist plot. It was sponsored by ExxonMobil, Xstrata (since swallowed by Glencore) and the ‘libertarian’ outfit TechCentral.